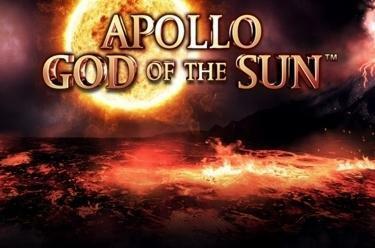 Play Apollo God of the Sun™ online for free now! In the slot Apollo God of the Sun™ you become familiar with the dashing sun god Apollo on 2 reel sets with 5 reels each and 100 pay lines in total. Apollo scores the highest Twist wins. Your aim with Apollo God of the Sun™ is to land 5 matching symbols on one of multiple lines. The pay lines run from left to right on both reel sets. The Scatter symbol - labelled with the word "Bonus" - does not have to stick to the line course: it triggers 8, 12 or 20 free games (Scatters land on reels 1, 3 or 5 only) when it lands 3, 4 or 5 times in any reel position. You complete your symbol combos with the Wild symbol (sun) because it substitutes for any symbol except for the Scatter symbol. The horse and the god Apollo can appear as stacked symbols on the main as well as the extra reel set which boosts your chances for Twist wins! During the regular game, sun symbols (Wilds) of the main reel set that occupy all four positions of a reel are transferred to the relevant positions of the extra reel set: For example, if 4 stacked Wild symbols appear on the third reel of the first reel set, the symbols on the third reel of the second reel set also turn into stacked Wild symbols. During free games Wild symbols are even more valuable: Here, individual Wild symbols are turned into stacked Wild symbols on the main reel set first (each position of the reel shows a Wild symbol) and then transferred to the extra reel set! If, for instance, a Wild symbol lands on reel 1 and 2 of the main reel set it expands to all positions. Subsequently, each symbol of reel 1 and 2 of the extra reel set is also turned into a stacked Wild symbol. The winning sun shines brightly in this slot! 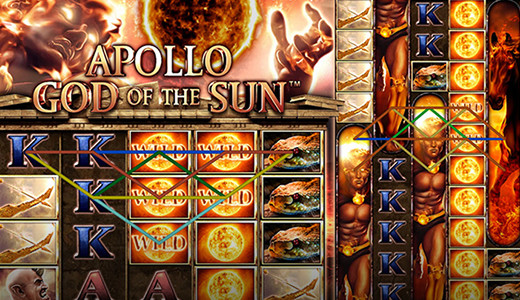 In Apollo God of the Sun™ the handsome sun god Apollo himself plays with the celestial fire ball and the symbols. And he's got plenty of room because this slot features no less than 2 reel sets where divine winning combos appear. If Apollo takes a shine to you he will make stacked Wild symbols appear on both reel sets and send plenty of Twists towards your player account!